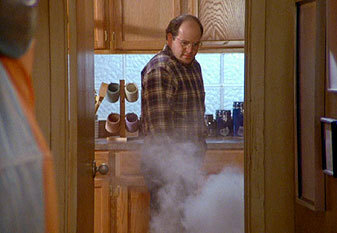 "The Fire" was the eighty-fourth episode of the NBC sitcom Seinfeld and the 20th episode for the 5th season. It aired on May 5, 1994. At Pendant Publishing Kramer is discussing his idea of a coffee table book about coffee tables with Elaine and his new girlfriend, Elaine's co-worker, Toby. Elaine finds Toby, as well as Kramer's book, very annoying. George is dating Robin(played by Melanie Chartoff, whom Larry David knew from the time they worked on the short-lived sketch series Fridays) a woman with a young son. Jerry is preparing his act to impress a critic. Kramer invites Toby to see Jerry's act, and she heckles, boos, and hisses him ceaselessly. As a result, Jerry gets a bad review from the critic. George, attending Robin's son's birthday party, cannot understand how Eric the Clown (played by Jon Favreau) doesn't know who Bozo is. Later George panics when a small fire breaks out and he rushes away, pushing down children, senior citizens, and the clown in the process. He tries to justify his behavior by saying how he acted bravely, like a "leader." Jerry takes the ultimate revenge for a comedian by appearing at Toby's workplace to heckle her; she runs out of her office and onto the street and loses her pinky toe. Later, Kramer retells the story of how he found the toe, boarded a bus, and fought a gunman just to go to the hospital. Toby got her toe reattached and was promoted instead of Elaine because her boss felt sorry for her because of the accident. At the club, Jerry convinced the critic to return to judge his performance again. Also in the club, George, inspired by Kramer's story, asks Robin for a second chance. However, he panics again at the sight of a comedian's prop gun and ruins Jerry's act.